I mean, people, it’s a kitchen appliance. Here’s what I, a well-adjusted and not fanatical user of this kitchen device, think of the Instant Pot: It’s good! It does the work, as promised, of both a slow-cooker and a pressure-cooker. 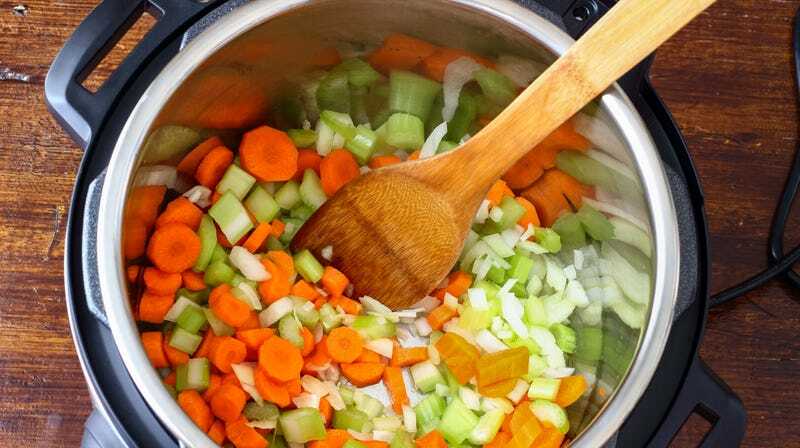 If you don’t intend to use it for pressure-cooking, then save yourself the expense and stick with your Crock-Pot, but if you’d like to speed up some tedious kitchen tasks, it’s worth a look. Here are the five most practical uses I, a person of sound mind, have found for my Instant Pot. From Melissa Clark’s fantastic Dinner In An Instant cookbook, I learned I could be hard-boiling eggs in my Instant Pot. Well, really, you’re steaming them, but I find that the 8 minutes it requires is not only faster than the stovetop method, but somehow the shells are easier to peel. Go figure. I’ve made yogurt in both a slow-cooker and an Instant Pot. It might sound complicated if you haven’t tried it, but with an Instant Pot, it’s literally accomplished at the push of a button (handily labelled ‘yogurt’). A real bonus of the Instant Pot is that you don’t have to strain your yogurt with a cheese cloth as you do with the slow-cooker version. It takes hours to make, but the yogurt is really delicious. I’ve stopped buying the store-bought stuff. I love beets and have grown a bunch in my garden this year, but sometimes the hour or so it will take to roast them in the oven (not to mention turning on the oven in the summer heat) discourages me from eating them as often as I’d like to. With the Instant Pot, though, when I want to make a beet-goat-cheese-walnut salad for dinner, the beets can be done in less than 20 minutes. They don’t get that caramelized edge that an oven would produce, but to me, the savings in time (and sweat) make up for it. This method also works for potatoes; again, you lose the crispy skin, but depending on what you’re using those potatoes for, that textural detail might not matter. I’m aware that a noodle dish that is not fried in a wok on the stove is not technically a stir-fry, but let’s not be pedantic. When I want to make a quick noodle-based dinner with whatever is left in my fridge, I now go straight to the Instant Pot. I use this as my base recipe, and throw in whatever veggies and protein I have on hand. You are reading that recipe correctly: It cooks the noodles and raw chicken and sauce all in 3 minutes. Three minutes, people. Tell me we’re not living in the future. I never mastered rice. I tend to forget it’s on my stove as I prep other items, and am rewarded with a layer of stuck-on rice goo that takes hours of soaking to remove. The Instant Pot makes foolproof rice because you set it and forget it. And if you use the towel-over-the-Instant-Pot method recommended in Melissa Clark’s book (I’m linking to it again because it’s so helpful), then you end up with non-clumpy, perfectly textured grains. So if you’re on the fence about the Instant Pot, I say it’s worthwhile if you want to combine a slow-cooker with the option of speeding up certain weeknight tasks. Of course if I’m making beets for a Thanksgiving side, I’m still going to roast them in the oven. But on a weeknight when I’ve worked late and the dog wants to be walked and the laundry needs washing and I told myself I’d make it to the gym, too—yeah, I’ll go for the 15-minute version. Does this convenience inspire me to declare myself “addicted” to the device or scream its praises on the internet? Well I guess it did the latter.